I hope you guys are having a fabulous 3-day weekend. Truth be told, it’s like any other weekend for us. Life with a newborn is different, as you know. I’m making homemade pizza for dinner…kind of the exact opposite of grilling outdoors, but these days, I’m just proud of anything homemade that I can manage to produce. My parents are coming into town tomorrow to meet Camille, so I’ll keep this short and sweet. 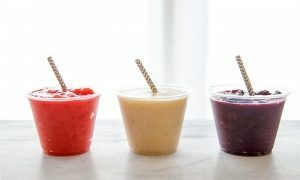 There was a time in my pregnancy where frozen and cold foods were mind-blowing. I run cold normally, and we’re the types of people that set our house to 80 in the summer. Coldness just doesn’t agree with me…normally. But ice cold food was my obsession. I made every kind of fruit smoothie, and ate every kind of ice cream. Oh mama. But then I needed to healthify my craving, so I turned to these coconut water fruit slushies. 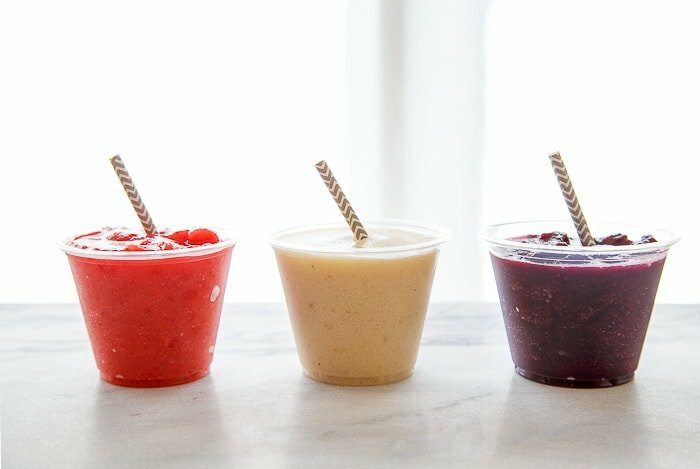 They each only have two ingredients: frozen fruit + coconut water. You can absolutely add a bit of agave to sweeten them up. I found that the strawberry and banana versions didn’t need to be sweetened, but the blueberry version could use a bump of sweetness. 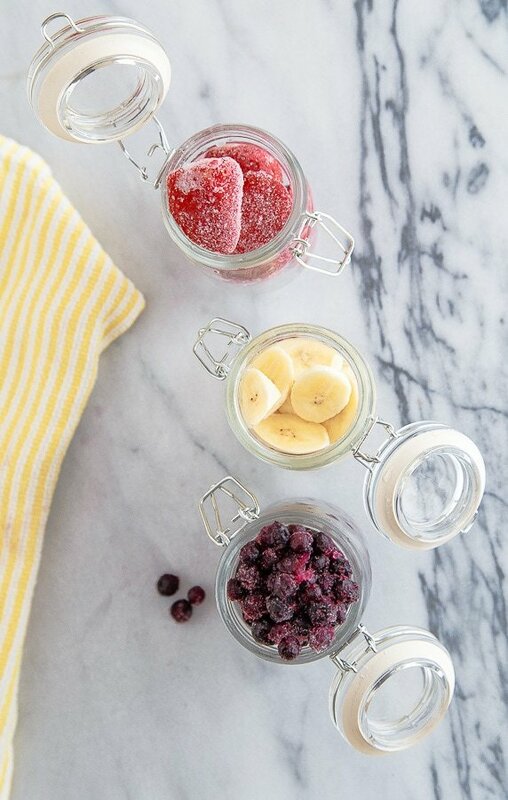 You can use frozen fruit right from the bag, or slice and freeze your own. You can layer them together for even more fun! P.S. Are you looking for an alcoholic version? I’ve got peach wine slushies and mixed berry wine slushies, too! In a high-speed blender, combine the coconut water and frozen fruit of your choice. I have to admit that I was on the fence until you said “wine.” Now I see a common ground. Now I have an excuse to replace my ninja blender. Oh man. Now this is my kinda drank. And I hear ya on all things cold..I am craving smoothies like no other! Unfortunately, the babes isn’t really liking sweets. One thing he didn’t get from his mama! 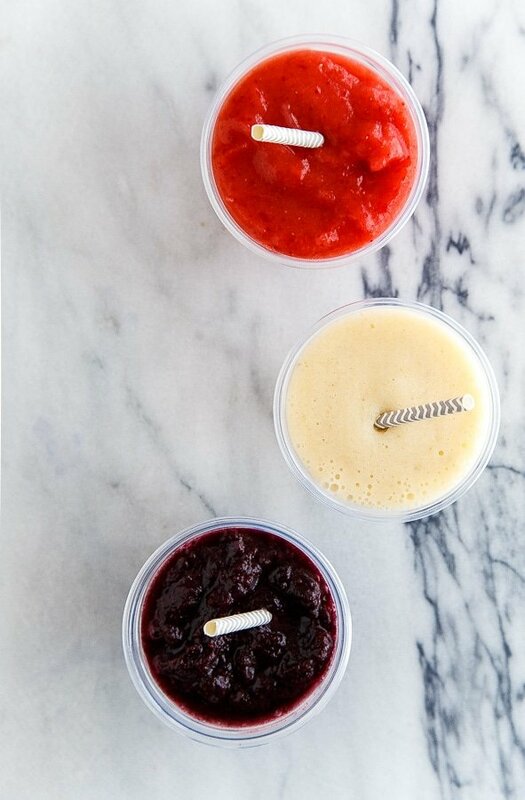 These look SO refreshing – cannot wait to try! I am with ya. I run on frigid. I need socks all the time. And blankets. But give me one of these slushies and I won’t complain. In fact, I’ll slurp it right down! This unsweetened option is perfect in a small size for a person who has blood sugar issues! I will tuck the idea away for when the weather here in the Midwest heats up! Still waiting! Girl You are blowing my mind with these coconut water slushes! such a good idea! And yes, totally be proud when anything is homemade. Life with a newborn is tough stuff, you feel like sleep walker most days but its amazing, especially when the fall asleep on you for hours. Bliss! I love this idea for summer and trying to stay hydrating. There is no better way then with something fruity and delicious! YUM! This sounds like a wonderful (and healthy) summertime dessert! I love your fruit slushies! Gonna live on these all summer long. I have a coconut water obsession and now all I want is every single one of these slushes. I would love to try a slice of your homemade pizza, especially if it comes with a side of these slashes! These sound sooooo good! Love the simplicity and color. Love these! Bookmarked and sharing on FB! Yum!!! I just bought fruit/veggie popsicles at the store after a random craving, but I’ll have to try these out Christina. 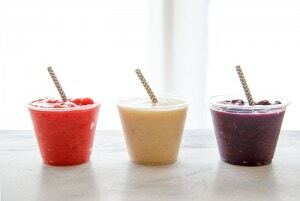 Perfect healthy alternative to ice cream if you want a sweet summer snack. Oh yum! These look delicious, and so simple. The layered slushy is pure awesome!! And I’m eyeing those boozy peach ones. Mmmm! My air-conditioner went out last week, we’re having a heat wave, and my apartment has been pushing 90 degrees since Friday night. I just made a raspberry slushie and I’m feeling about 100x less cranky. Thanks for saving my sanity! 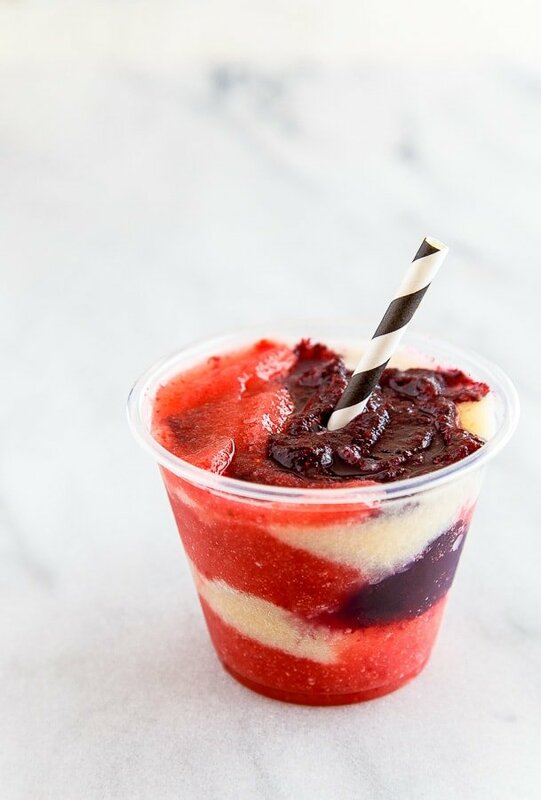 These slushes look like the perfect way to stay cool this summer! It’s such a hot day. 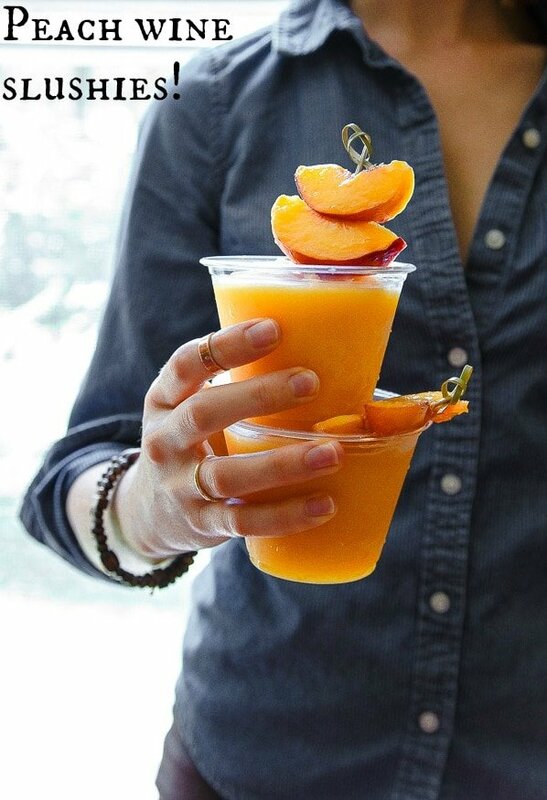 I would definitely enjoy one of these slushies right now (a mango version seems really good). These look amazing and super refreshing! What a great idea! I did not know you were writing another cookbook, I saw it on Amazon.com and preordered it.